18 March 2010 The Corot satellite strikes again with another fascinating planet discovery. This time, the newly discovered gas giant planet may have an interior that closely resembles those of Jupiter and Saturn in our own Solar System. Very few planets are temperate enough to allow the presence of liquid water, but the newly discovered Corot-9b is one of them. It was found on 16 May 2008 and orbits its star every 95.274 days, a little longer than Mercury takes to go round the Sun. 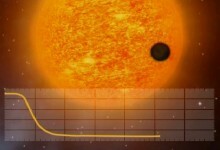 More than 400 exoplanets have been discovered so far and 70 of them have been found by the ‘transit’ method. A transit is a kind of eclipse and occurs when a celestial body passes in front of its host star and blocks some but not all of the star’s light. This temporarily dims the apparent brightness of the star and enables the planet’s mass, diameter, density and temperature to be deduced. The time between similar transits gives the orbital period of the planet. 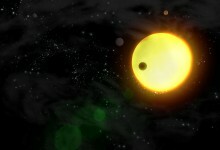 Corot-9b is the first transiting planet to have both a longer period and a near-circular orbit. Its orbit is slightly elliptical but at closest approach to its parent star it reaches a distance of 54 million kilometres. Although that is only about the distance of Mercury in our Solar System, it is by far the largest orbit of any transiting planet found so far. Because it orbits a star cooler than our Sun, calculations estimate that Corot-9b’s temperature could lie somewhere between –23°C and 157°C. Corot-9b has a radius around 1.05 times that of Jupiter but only 84% of the mass. This leads to a density of 0.90 g/cc, or 68% that of Jupiter. “Corot-9b is the first exoplanet that is definitely similar to a planet in our Solar System,” says Hans Deeg, a researcher at the Instituto de Astrofísica de Canarias, whose paper on the discovery is published today in Nature. The similarity is caused by the fact that Corot-9b is sufficiently far from its star to prevent tidal forces from heating its interior. Tidal forces are created by the strength of gravity weakening from the front to back of the celestial body. When the difference between the near side and the far side is great, the tidal force can prevent the planet from spinning quickly, forcing it to only show one face to the star. It can also provide heat to the interior of the planet, changing its physical condition. Based on calculations, neither of these is possible in this case. “Although we don’t know, because we can’t see the planet directly, there is reason to believe that this planet has a normal day-night cycle,” says Malcolm Fridlund, ESA Project Scientist for Corot. It means that lacking a tidal heat source, Corot-9b’s interior is likely to have remained similar to the gas giants in our Solar System. ← The enigma of methane on Mars. Puma Punku stone cutting: What Makes The Ruins Unique? It is highly unlikely that any of the stones in Puma Punku were cut using ancient stone cutting techniques, at least not those that we are aware of. The stones in Puma Punku . Do Aliens Live Among Humans? Extraterrestrials have been a topic of ancient alien researchers’ conversations for many years. Do the aliens live among humans? Have the aliens visited earth before our time? One of the biggest questions in our past is .